Starting seeds indoors is one of the best parts of gardening. You can finally get your hands in the soil after a winter break. A gardener’s shelf full of tiny seedlings is a sure sign that’s spring is on its way! Unfortunately as with everything in gardening growing transplants from seeds has its challenges. If you want to have awesome seedlings this year be sure to avoid these common mistakes. Unfortunately, setting your seedlings by a window probably isn’t going to give them enough light to become strong and healthy seedlings. Odds are they’ll become tall and spindly, reaching towards the light. You’ll have to provide them with some form of supplemental light. You don’t need to buy actual grow lights, simple garage or shop lights will do. You want the lights to be as close as possible to the tops of the plants without burning them. Setting up your lights so you can easily adjust their height as the plants grow is a great idea. Not addressing a variety’s specific needs. 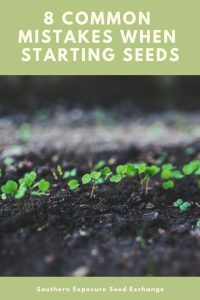 While many seeds are pretty simple to grow, just push it some dirt and water, others require a bit more care. Some seeds need to be soaked overnight before planting, some need light to germinate, while still others need to scarified. Always check package directions and do research as needed. Not hardening off your seedlings. As your seedlings are accustomed to a climate controlled life indoors, they could succumb to shock if you decide to set them out without first acclimating them to their new environment. Start by setting them outside for just a few hours per day slowly adding time over the course of two weeks. This will allow them to adjust the intense sunlight, temperature, and wind. You can take this a step further by transplanting your seedlings on an overcast day so they don’t have to struggle with intense light on top of the shock of transplant. Seedlings should always be kept moist but they’ll rot if they’re just sitting in water. Whatever you plant your seedlings in should a hole or holes in the bottom and a tray underneath to catch any excess water. You also need to ensure that they don’t dry out completely which can happen surprisingly quickly as seedlings grow larger. Not putting them somewhere noticeable. Unless you’re a full-time market gardener it’s easy to forget about and neglect your seedlings. Setting up your shelf somewhere you walk by often will help you remember to care for them and make it easy for you to spot problems as soon as they arise. Not keeping them warm enough. While some plants like spinach and lettuce germinate and grow well in cool weather, others like tomatoes and peppers like things pretty warm. If you notice that your seeds are taking a long time to germinate, are slow growing, or you live in a cool or drafty home you may want to invest in a heat mat. These can be placed underneath seedling trays and will help the soil stay at an optimum temperature. Using garden soil instead of a proper potting medium. You don’t necessarily have to buy a potting mix but you do need something other than plain old garden soil. Potting mixes always include something like peat moss to hold some moisture but are also light so that they drain well. You can find many DIY recipes for potting soil on the internet. If you’re purchasing soil and want it to be organic look for something that’s OMRI (Organic Materials Review Institute) certified. Starting them too early and/or not potting them up. If you start your plants too early they can outgrow your pots before your ready to plant them out. In this case, you’ll need to pot them up. If you don’t do this they can become root bound which may stunt their growth and weaken them. 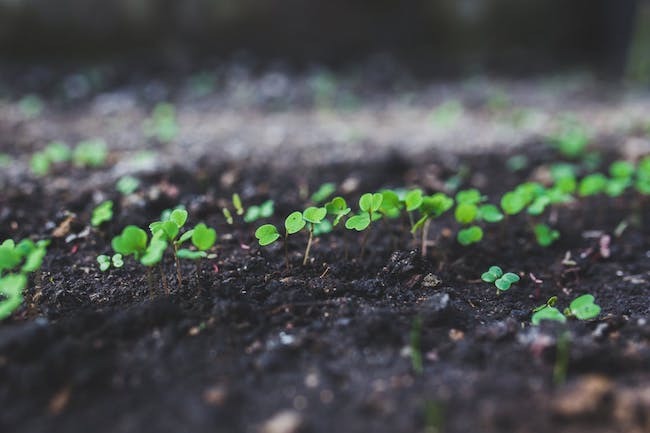 If you’ve struggled with growing your own transplants in the past being careful to avoid these common mistakes can help you have a productive garden this year. Sign up to receive our blog via email. Do Wood Chips Make Good Mulch? Don’t Let Downey Mildew Get You Down!